Hypertension, cardiac problems, diabetes, joint pains, kidney infections, cancer, tuberculosis and eye problems are some ailments that generally affect senior citizens. These disorders require proper and in some cases prolonged treatment. 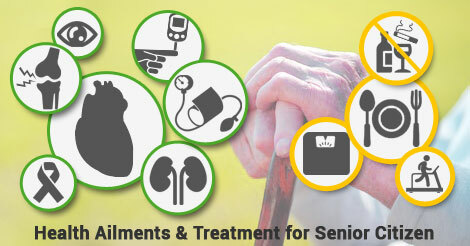 Medical treatments for senior citizens include various cures ranging from allopathic to naturopathy treatments. In this section, we give you information about common health problems that affect senior citizens, prevention tips and treatment centres. If you are an older person, it is important that you get medical checkups regularly to prevent the onset of any of these health conditions. Once they occur, these conditions may take a long time to heal. This leads to a lot of unnecessary expenses and stress. That’s why prevention is the best cure. If you are unsure about your doctors’ diagnosis, it always helps to get a second or third opinion from other doctors. Beware of fake or unscrupulous doctors who are out to make a quick buck. Government Hospitals are a good guarantee of the right diagnosis plus they are much cheaper than private hospitals. Always consult your doctor before undertaking any exercises, using medicines or dieting. Arthritis is the inflammation of the joint. It is the leading cause of disability in people over the age of 55. There are different types of arthritis that cause varied levels of discomfort. Treatment options include physical therapy, occupational therapy and medication as well as procedures such as an Arthroplasty or joint replacement surgery. A balanced diet, body cleansing, physical activity, sweating and relaxation techniques may be used make patients feel better. Osteoporosis is a silent disease in which bones become extremely fragile. If left untreated, it can progress painlessly until a bone breaks. These broken bones, also known as fractures, typically occur in the hip, spine and wrist. They are extremely painful and can take a long time to heal. Take your recommended amounts of calcium and vitamin D daily. Take a bone density test to check the condition of your bones. Lack of interest in activities you enjoyed doing. Change in appetite and sleep patterns. These health issues are characterized by confusion, memory loss and disorientation. Diseases such as Parkinson’s and Huntington’s as well as high blood pressure and strokes may cause it. When organs such as the heart, lungs, thyroid, pituitary and other glands do not function well, mental processes are affected. This leads to Dementia. Dementia is different from general forgetfulness and confusion that is a part of old age and can be easily reversed. Alzheimer’s is a slow and gradual disease that begins in the part of the brain that controls the memory. As it spreads to other parts of the brain, it affects a greater number of intellectual, emotional and behavioural abilities. There is no known cause for this disease. The best way to prevent these conditions from occurring is to keep yourself mentally busy. Take part in activities such as dancing, yoga and meditation. Read books, play board games and interact with other people to enhance the quality of your life. Eat a balanced nutritious diet and avoid alcohol and smoking. Consult your doctor about mineral and vitamin supplements that could be of help. In some cases you may be prescribed medicines. Blood pressure refers to the force exerted by circulating blood on the walls of your blood vessels. Typical values for a healthy adult human are approximately 120/80. Large variations in blood pressure levels can be dangerous, so it always helps to keep your pressure under control. This can be done through regular checkups, medicines, lifestyle changes and relaxation techniques. Here are some basic steps that may be followed. Follow a healthy eating plan that emphasizes fruits, vegetables and low fat dairy foods. Drink alcoholic beverages in moderation. Cool down after exercising. Stopping in the middle of an exercise routine can drop blood pressure. Drink healthy juices or any non–alcoholic drinks. Take a walk after having a meal. This helps in bringing the blood pressure level to normal. Please consult your doctor before undertaking any of the above steps. A heart attack is caused by the death of the heart muscle due to loss of blood supply caused by blockage in one or more of the coronary arteries. In India, heart disease is the single largest cause of death in the country. Most heart problems are directly related to unhealthy eating habits, stress and lack of physical exercises. To prevent heart attacks or other heart diseases, it is important to make changes in your lifestyle and live a healthy life. Undergoing medical check–ups regularly is equally important. Eat a healthy diet to prevent or reduce high blood pressure and blood cholesterol levels. Participate in a physical activity. Do healthy exercises, walk, run and practice yoga (under supervision or guidance).